The Unlimited Cricket-Cell-Phone-Plan is a Cell plan with several options. Unlimited calls, Unlimited text messages, and Unlimited picture messages make the Cricket plan the best heavy user phone plan wherever it is available. is the basic plan. With this plan all the local calls are free and you long distance is not available. It is fairly simple to use a long distance calling card with this plan though. Now Free Texting and Picture messaging with all new Cricket plans. 100 roaming minutes per month included. The online deals on buying a Cricket phone are always $20 to $50 better than buying from the Cricket Store. You still can use the store or the web for customers service but you will save a few bucks buying online. Check to see if Cricket is available where you live. If you use a lot of minutes and live in an area where Cricket is available it is definitely one of the best Pay as you Go Wireless plans. 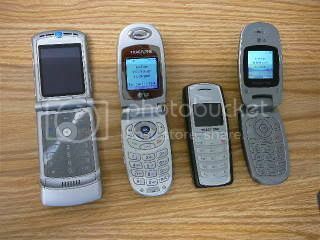 Cricket Motorola Razr, Tracfone LG 3280, Nokia 2126, Net10 LG 200c Prepaid Cell Phones. You will automatically be signed up for (“ABP”) with any Cricket plan purchased on the web. Waived if you sigh up for Automatic Bill Payment when you sign up for service. With ABP, your credit card will be charged automatically every month. If you don't want to sign up for ABP you may purchase Cricket from a Cricket store or authorized dealer. Another great part of the Cricket plan is their phones. They have many of the nicer phones available for prepaid. They are expensive to buy. You do not have to sign a contract and if you let your service lapse you do not have a $200 disconnect fee. Ready to talk without limits? Try the Cricket-Cell-Phone-Plan. There are No Penalties with Cricket. Most of the large contract phone companies penalize you for many things. If you let your service lapse, if you go over your minutes, if you use too many text messages. Verizon, Alltel, AT&T will charge you dearly for using too much. Cricket is UNLIMITED. Use all the minutes and texts you want for one Very low price. Roaming is very expensive .69 per minute and the areas where the Cricket plans work are fairly small. The Cricket only works in 39 markets in the US. It is very inexpensive where it works.